Law degree at the University of Bologna (1994). Certificate of professional practice at the Court of Appeal of Innsbruck (Austria) (1995). Member of the Treviso Bar Association since 1999. 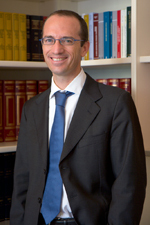 Since 1996 he has worked at the Law Firm Gardenal & Associati, of which he has been associated since 2002. Since 2002 he has been a member of AIJA (Association Internationale des Jeunes Avocats), for which he has participated, also as a speaker, in numerous conferences in Italy and abroad. Within the AIJA, he was President of the “Private Clients’ Commission” and Vice-President of the “Human and Procedural Rights and Responsibilities Commission”. He is a speaker in seminars and training courses organized by various institutions and institutions (eg: course on international contracts organized by the IIR – International Research Institute, “E-commerce and telematic contracts: legal profiles” at the Chamber of Commerce of Treviso). He collaborates with “Newsmercati” (online newsletter of companies that work with foreign countries) in the drafting of articles on European and international civil and commercial law. He taught at the IBATAX Master: Commerce, Taxation and International Arbitration / International Business, Arbitration and Tax Law of the Cà Foscari University of Venice. Commercial law, national and international contracts, company law, commercial trial law, private international law, training in commercial and international law.